Mom spent the afternoon in the office yesterday. 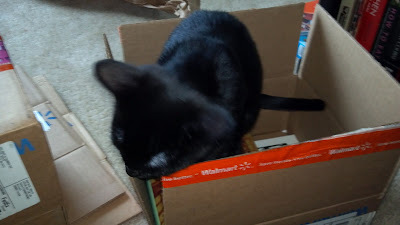 Usually she sits at the desk, but she was sitting on the floor putting all her books in boxes. This looked like a big job, so I thought I'd be a good girl and help her. Yep, there's room for another book in here. Mom told me that she was packing our stuff so we could move into the new house. She said it was very exciting. It's making me a little nervous, but I'll still help! I was very excited when I heard that Homer the Blind Cat's mom, Gwen Cooper, was writing another book. Homer's biography was a favorite of mine, so I knew I would love his mom's new novel. 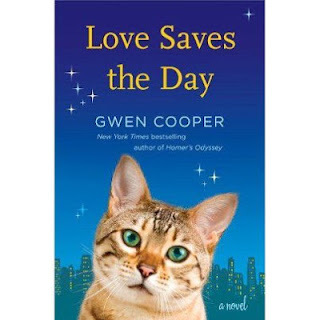 Love Saves the Day is a work of fiction, but the two cats in the book, Prudence and Honey, are based on Homer's real-life sisfurs Scarlett and Vashti, both now at the Rainbow Bridge. Prudence lives a happy life with Sarah, her Most Important Person, until one day, Sarah doesn't come home. Prudence then goes to live with Sarah's daughter, Laura, but is sad and confused about all the changes. Laura is going through her own confusion and sadness. Through the hard times, Prudence and Laura start to bond. Prudence is a very proper cat. She is dismayed when humans show bad manners toward her. She also doesn't understand when humans don't pick up on her very clear signals. Sarah was always polite and knew how things were supposed to be done. Laura and her husband, Josh, need training in these aspects. It's a task Prudence takes on, all while trying not to lose her Sarah-memories. Love Saves the Day is very moving. All of the love between the characters is beautiful. You will most certainly need tissues though. All of the love made Mama's eyes leak. Harvey read the book with Mama. Sarah and Laura had a very strained relationship. Chapter 13 finally explains the reason for the distance. Mama cried a lot during this chapter. It took her back to last February, watching our apartment building burn down. We, along with all of our neighbors, lost our home. One neighbor in particular was not allowed to go back in to get his cat. It was almost as if Gwen had been there that night and fictionalized the scene. In the book, Sarah and Laura watch their apartment building get torn down while their upstairs neighbor begs to go back in for his cat. At one point, Mama was sure Gwen was trying to kill her. She sobbed trying to get through chapter 13. Gwen did a beautiful job describing a horrific moment in people's lives. I love cabinets. It's fun to explore inside and sometimes I just want some alone time. What better place than inside a dark cabinet? Mom disagrees. She says, "Remember about curiosity and the cat!" Whatever, Mom. Your hair products won't kill me. Wordless Wednesday-Where Do You Think You're Going? Mom bought us a new toy on Friday. It wasn't a jingle ball like I love or a sparkle ball like Evelyn carries around. It was catnip bubbles by Hartz! Mom & Dad had been shopping at Crown Center in Kansas City. Of course, Mom had to go to her favorite store there, Gatos. They have the coolest cat stuff and have some neat toys Mom doesn't find anywhere else. Once they got home, Mom decided to see what we thought of the bubbles. I was immediately mystified! If it took too long for Mom to blow more bubbles, I meowed at her to hurry up! At first, Evelyn didn't really get it. She got bored and walked away. When Mom brought them back out again on Sunday, Evelyn figured it out. This was fun! We had a great time watching the bubbles float in the air. I can't wait until we get to play with them again! We were in no way compensated for this post. Mom just really loves to shop at Gatos and bought the Hartz bubbles because they looked cool. One of my favorite things to do is chat with Mom in the bathroom while she's getting ready. Isn't that what girls do? A lot of folks are posting year end wrap-ups. I decided not to do that. Instead, I'm looking forward. I made some additions to my blog and I'd like you to check them out. Click on the About Us tab on the top of the page and take a look! Here's to a great New Year and a successful 2013 for all of my pals!